Will South Carolina Be Jeb Bush’s Last Stand? John Ellis “Jeb” Bush began as a leading contender for the Republican nomination in 2016, owing in part to what is generally considered to be a successful tenure as governor of Florida, a broadly conservative record likely to appeal to Republican voters, and the strength of and respect for the Bush family name in Republican politics. He later fell to the middle of the pack and has struggled to revive his campaign. By and large considered a neo-conservative in the mold of his brother, former President George W. Bush, the former governor of Florida is a distinct candidate in several respects. Most noteworthy, Hispanic outreach has been a linchpin of Jeb Bush’s career. In addition to speaking fluent Spanish, he graduated from the University of Texas with a degree in Latin American affairs, and he traveled abroad to teach English in Mexico as part of an exchange program. As governor, Bush focused on school reform, including advocating for a generous school voucher program. He has supported free trade, been a staunch opponent of Obamacare, and expressed skepticism of climate change as a man-made phenomenon. He has also supported construction of the Keystone XL pipeline and favored free markets over regulation. Bush shares his family’s philosophy of endeavoring to build bridges across party lines. A sometime critic of the Tea Party movement, he has urged Republicans to work with Democrats to address landmark issues, immigration in particular. This approach has garnered praise from establishment Republicans while rankling grassroots activists. Bush has made overtures to the latter group, softening his tone on immigration. Bush’s staff includes a mix of long-time advisers and high-profile strategists. Sally Bradshaw has been compared to Karl Rove in terms of her relationship to Jeb Bush as a political counselor. She served as his chief of staff in the governor’s office and helped him get many of his policy priorities through the Florida legislature.1 Mike Murphy has worked for both former Massachusetts Gov. Mitt Romney and Arizona Sen. John McCain, both of whom went on to secure the Republican nomination. Kristy Campbell, who serves as Bush’s spokesperson, is also a former Romney aide. While Bush has many strong qualities as a candidate, there is some question whether Republicans and general election voters are ready for “another President Bush.” While his record is generally consistent with conservative ideas in the areas of free markets, national security and American exceptionalism, his position on immigration is likely to draw scrutiny from conservative voters in the nomination process, as is the general perception that Bush is closer to “establishment” rather than grassroots activists and those who might challenge party insiders. Bush began as one of the top candidates for the GOP nomination but has failed to live up to expectations. His fundraising has been good compared with most of his rivals’, but he has not proven himself to be the formidable fundraiser many thought he would be, and while the independent super PAC backing his bid for the White House has raised far more than those of his rivals, its spending to date has not significantly bolstered his standing in the polls. His campaign may have received a needed boost in the New Hampshire primary, where he finished fourth out of nine candidates and, most importantly, ahead of one of his key rivals. He remains a viable candidate and has the potential to emerge as an establishment favorite, but he now must build on a good-but-not-great finish in New Hampshire with a strong showing in South Carolina if he wants to remain competitive. One of five children born to former President George H.W. Bush and former First Lady Barbara Bush, Jeb is part of one of America’s most prominent political dynasties. His older brother, George W. Bush, preceded Barack Obama as a two-term president. Like much of his family, Bush got a relatively late start in politics. An attendee of the prestigious Phillips Academy, he is married to Columba Bush, whom he met while in Mexico on a high school foreign exchange program teaching English. In addition to his educational background, he speaks fluent Spanish. After graduating, Bush went to work for Texas Commerce Bank, an opportunity he received through James Baker, an old family friend who would go on to become his father’s secretary of state. In this capacity, he worked on developing operations in South America. In 1980, he moved to Florida, where he would eventually become the state’s first two-term Republican governor. His political career began when he served as chairman of the Dade County Republican Party. From there, he was appointed Florida’s secretary of commerce by then-Gov. Bob Martinez. In 1994, Bush unsuccessfully ran for governor. As governor, Bush continued to make Hispanic outreach a priority, while also working to reform the state’s failing public education system. He earned plaudits for his handling of a particularly rough hurricane season in 2004. Unlike most of his family, Bush is a professed Catholic, having converted from the Anglican Church. He presently attends Church of the Epiphany in Miami and belongs to the Knights of Columbus. Bush’s business dealings have attracted criticism from opponents and pundits alike. By his own admission, he traded on the family name to garner access to exclusive social circles and prime business deals. 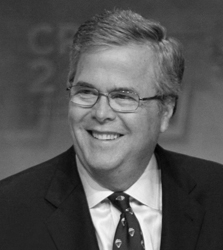 More than most politicians, Jeb has spent substantial time and effort in the private sector. By and large, Bush governed in accordance with his campaign rhetoric. He was not afraid to reform key entitlements, such as Medicaid, and was persistent in taking on union interests related to transportation and, of course, education. He has long taken a stand different than most of his party on immigration, but he has also won the support of Democrats for many of his reform initiatives. On foreign policy, Bush’s philosophy remains essentially unchanged. He has consistently supported neoconservative causes, having joined the Project for a New American Century in 1997. More recently, he has taken a strong stance against ISIS, called for a stronger position with regard to Iran, and supported free trade, especially in South America. There have been few deviations in these positions over the years, though he has had limited opportunity to guide policy on these matters. Bush’s early business associates and clients have drawn scrutiny, including a man called an “infamous Medicare swindler”7 and an anti-Castro Cuban terrorist,8 suggesting a lack of judgment regarding with whom to do business. Bush seems to have worked hard to implement his agenda and stick to his principles, although there are always inevitable shortcomings. There are few obvious character flaws apparent from Bush’s history, although as a member of the Bush family and someone seen as connected with traditional Republican establishment figures, there are few obvious signs he has gone out of his way to challenge party insiders or influential interest groups. But despite Bush’s reputation for being a skilled communicator, he has made a number of verbal stumbles on the campaign trail, such as first saying he would have made the same decision as his brother President George W. Bush in invading Iraq, then said he wouldn’t answer the question because it was a hypothetical, and finally clarified that he would not have authorized the invasion if he had been president and known then what is known today.10 He also said, “I’m not sure we need half a billion for women’s health programs” in comments supporting cutting funding for Planned Parenthood11 and suggested the term “anchor baby” was primarily about “Asian people.”12 He struggled in the early debates, often being overshadowed by more forceful personalities and delivering relatively tepid responses to his rivals and to questions from moderators.13 His more recent debate performances have been much better. Bush has written numerous pieces for national media outlets, including The Wall Street Journal14 and the Washington Times.15 He has also made numerous national television appearances, and has generally remained in the spotlight in the eight years since his tenure as governor. In addition to immigration, he has been a leading voice on free trade, right-to-work, and economic deregulation. As governor, Bush pioneered the “A+” plan, which graded schools on the basis of student test scores. The plan recently turned 15 years old, and Bush has been vocal in promoting its success in improving student outcomes. On this issue, he has also found support from the black community. In co-founding Liberty City Charter School, he worked alongside T. Willard Fair, a renowned black activist and head of the Greater Miami Urban League.17 Other states have begun to implement components of Bush’s “A+” plan, with positive results. There was a small walkout by some tea party activists, however, suggesting Bush has work to do to if he hopes to gain the full support of limited-government activists. Bush has shown himself over more than two decades in public life to be an effective communicator, able to build coalitions that can help him advance his public policy aims, skills that would serve him well on the campaign trail and in the Oval Office. It has been more than a decade since he ran for office, however, and his flubbed response regarding the Iraq invasion suggests he will need to sharpen his skills to avoid future embarrassing gaffes. Bush did not sign the Americans for Tax Reform pledge in any of his three campaigns for governor. According to the AFL-CIO, by 2005 he had entered into 140 contracts with private entities to perform services previously performed by state employees. He also endorsed the Ryan budget’s provision to consolidate federal job training programs in an effort to reduce waste and duplication,55 and his tax reform proposal included an expansion of the Earned Income Tax Credit, allowing many childless workers under age 25 to be eligible for the first time and doubling the maximum credit available to childless workers from $503 to $1006. He has demonstrated support for statewide right-to-work laws throughout the country (Florida has been a right-to-work state since 1968) and penned a Washington Times op-ed in praise of Michigan Gov. Rick Snyder’s efforts to get such laws passed in his state. Among other things, right-to-work laws allow employees of unionized companies to opt out of paying union dues. He favors continued economic cooperation with China. In 2012, he met with then-Chinese Vice President Xi Jinping, who has since become that nation’s leader. Xi praised the Bush family’s role in developing closer ties between the two nations, and according to Chinese state-run media Bush pledged to contribute to economic diplomacy between the two nations. 80 He has offered few policy specifics, however, and has not made relations with China a centerpiece of his rhetoric and advocacy. Bush announced an ambitious education reform plan in January 2016. One key element of the plan includes converting tax-deferred college savings accounts, called 529 plans, into Education Savings Accounts that allow money to be contributed by anyone and the funds to be used for early childhood, elementary and secondary school, college, job training, tutoring, or other educational purposes. Contributions made to the accounts of low-income children would be tax-deductible.114 States would also have the flexibility to give federal funds directly to parents or have it “portable” and follow the child in order to increase educational choice.115 His plan also includes supporting charter schools and Washington D.C.’s school voucher program. Under Bush’s “A+” plan in Florida, students were required to meet certain standards in order to be promoted to the next grade, and teacher salaries were similarly tethered to those standards. The plan recently turned 15 years old, and Bush has been vocal in promoting its success in improving student outcomes. He also said he favors a campaign finance system in which people are free to support the candidates and causes they believe in without limits, but with disclosure,124 generally in line with free-speech advocates who oppose most regulation of money in politics. Bush also signed an executive order prohibiting affirmative action in government hiring, contracting, and college admissions.136 As governor, Bush supported faith-based initiatives to address a number of social and economic issues. While he feels this is in line with his commitment to empowering private citizens to solve societal problems, he was been willing to use state dollars to this end. Bush has verbally distanced himself from his party on many issues related to immigration, having staked his ground as an expert and advocate on behalf of immigration reform. He was famously quoted as saying illegal immigration is “not a felony. It’s an act of love.” He is on the record supporting a path to, at minimum, permanent legal status for immigrants already in the United States.137 These positions are likely to be controversial among the Republican base. Bush’s last name may not be his only family problem on the campaign trail. His wife, Columba, returned from a Paris trip and was found to have about $20,000 worth of purchases that required declaration at customs, although she had only claimed $500 on the customs form. She wound up paying hefty fines for this.138 His wife is also considered to be averse to publicity, something that would be a problem on the campaign circuit. Perhaps as problematic to his candidacy is the family’s perception among voters. While he earned praise for his handling of the Florida hurricanes, this was well before Hurricane Katrina, for which George W. Bush’s administration was harshly criticized. In fact, it would be nearly impossible to discuss a Jeb Bush presidential candidacy without surveying the extent of so-called “Bush fatigue” among voters. While Bush landed a number of victories during his tenure, he has seen a number of his signature initiatives involving education, cultural and health care related issues reversed by higher courts. His statewide school voucher program, for example, was struck down in 2006.139 The charter school Bush helped to found, once regarded as a pioneering success, closed in 2008 after accruing over $1 million in debt. Much of Bush’s policy agenda as governor is no longer in place. As such, he might have a difficult time pointing to his accomplishments on the campaign trail. Rumors in the past have linked Bush romantically to ethically plagued Florida official Cynthia Henderson.140 The rumors managed to work their way into statewide print media, though no hard evidence was ever produced suggesting the two were romantically involved. Bush steadfastly and publicly denied the allegation.